Boy, do I have a feeling I’m going to provoke a lot of anger among the Nerdfighter community with this. All I ask is that you hear me out. I’ve read all of John Green’s full-length, independently written novels (opting to skip all the collaborations and side projects). I find him to be a mostly charming, witty writer, but I’ve never obsessed over him the way his impressive legion of fans (called Nerdfighters) have. Clearly, I’ve enjoyed him enough to keep checking in every time he’s published a new book, but there have been enough flaws or annoyances to keep me a little jaded about the experience. The Fault in Our Stars may have officially tipped the scales against Green for me. It’s the first time I’ve really found myself irritated by a Green novel. I’m going to insert a disclaimer here before anyone tries to accuse me of lacking sensitivity for people who are terminally ill. Both of my parents have had, or still have, cancer at the time of this writing. My partner lost his mother to cancer. I also had a beloved aunt who spent the first twenty-three years of my life fighting recurrences of cancer before succumbing (in fact, I was never actually supposed to meet her, since she was given roughly six months to live upon her initial diagnosis–which was six years before I was even born). I’ve worn a Live Strong bracelet on my wrist every day for the last seven years to remind me of their struggles and the importance of really living every single day. Furthermore, I count the play Wit among my favorite books and Terms of Endearment reduced me to emotional rubble (seriously, I can’t even watch it. I cried so hard I made ludicrous, hiccupy snuffling noises that made me glad no one was there to witness it). So please believe me when I say that when I found the protagonists (Hazel Grace Lancaster and Augustus Waters) of The Fault in Our Stars irritating, it had nothing to do with their illnesses and everything to do with the way Green constructed their personalities. I’ll get to my problems with the plot itself at the end. Green has an upstanding history of creating lovable nerds. He is an author who really understands and celebrates the underdog–the so-called “losers” of the world. It’s why his fan community is known as Nerdfighters (not to mention why he has such a massive fan community at all). He’s subverting the paradigm that being intelligent or “weird” is wrong (if Glee were capable of consistent storytelling it would be spreading the same message on TV every week). But here’s the thing: in all of his other books I’ve believed in his over-articulate outcasts without an incredible suspension of disbelief. I don’t believe in Hazel and Augustus the same way. Their dialogue is at best contrived, at worst cloying and, well, ridiculous. I chalk this down to the fact that Hazel and Augustus are worth more to Green as Metaphors than as characters. Everything they do has to be Significant and Important and Meaningful. The main plotpoint, where they embark on a quest to find the author of Hazel’s favorite book (which famously lacks closure) so they can find out what happens after the last sentence, is a rather obvious metaphor for their fear of death. For goodness’ sake, Hazel can’t even eat dinner without opining that eggs are the victims of typecasting. “I mean seriously,” she intones, “How did scrambled eggs get stuck with breakfast exclusivity? You can put bacon on a sandwich without anyone freaking out. But the moment your sandwich has an egg, boom, it’s a breakfast sandwich … I don’t want to have ‘breakfast for dinner’ … I want to have scrambled eggs for dinner without this ridiculous construction that a scrambled egg-inclusive meal is breakfast even when it occurs at dinnertime.”* Do you get it, you guys? The egg is a Metaphor. I just blew your mind, didn’t I? It’s OK, take a second if you need to. Augustus is, if possible, even more obviously cratered with Metaphors. His desire to die heroically is repeatedly signified by his obsession with sacrificing his virtual life in video games instead of winning the game (then, irritatingly, Green feels the need to explain it toward the end anyway Just In Case You Missed It). He’s the kind of guy who likes to keep an unlit cigarette between his lips, and will gladly explain it’s metaphorical significance to you if you ask politely (“You put the killing thing right between your teeth, but you don’t give it the power to do its killing.”), prompting Hazel to remark that he chooses his behaviors based on their metaphorical resonance and Fall Irrevocably In Love With Him. And there’s the other problem I have with Augustus and Hazel: their romance feels like a plot construction far more than it feels like a natural stars-crossed Passion For The Ages. In Green’s other books, I believed that Miles fell for self-destructive Alaska, I believed that Margo Roth Spiegelman captivated Quentin Jacobsen enough to make him search for her after she disappeared (in Looking for Alaska and Paper Towns respectively). There was something about their force-of-nature presence that made it believable that someone like Miles or Quentin would be lured in. But Augustus Waters just shows up in Hazel’s cancer support group and stares at her like Creepy McCreeperson and she just swoons at him. I’m sorry, that’s almost as bad as Bella Swan falling in love with Edward Cullen even though he apparently hates her and is stalking her outside her bedroom window. Green attempts to play it cool by having Hazel recognize that she’d be creeped out if it were an ugly guy staring at her, but that doesn’t make their love affair any less sudden or any less inexplicable. But the plot won’t work if they aren’t in love, so reason be damned, and there it is: love at first sight. And that brings us to my problems with the plot itself. Observation: repeatedly beginning lines of dialogue in which your characters are supposed to make an Important Observation about Life As We All Know It with “Observation: …” gets old, especially when the Observation(:) is as trite as “standing in line is a form of oppression.” Observation: Random Acts of Capitalization don’t make your writing endearing or quirky. Please To Stop. Nevermind the fact that all the peripheral characters are completely flat (definitely an accusation I never expected to make about John Green)–if they don’t matter to the author, why should they matter to us? That the plot is dully predictable is a greater offense to me. The “plot twist” recurrence, the acceptance of fate, the lessons learned by the protagonist at the end … you see it all coming a mile away. The strength of The Fault in Our Stars is that it refuses to offer false comfort regarding a subject matter that does not have any happy ending: we are all going to die, but we live our lives pretending that words like “forever” or “always” have meaning (think of Isaac’s subplot in re: the latter word). I suspect this is a new concept for many people; maybe that’s why it resonates with so many readers. Perhaps I’m more morbid than your average person, but it was nothing new for me. And it’s been done better (the aforementioned Wit for one). 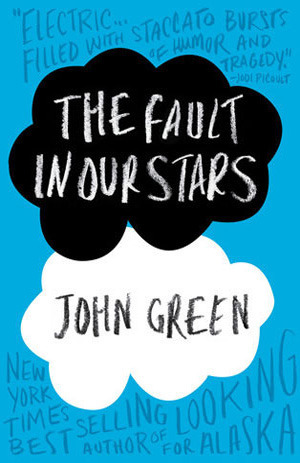 The Fault in Our Stars wants to have it both ways: it wants to reflect the harsh realities of impermanence and death, but it wants to leave the reader feeling good in the end (consider that the book Hazel loves so much is lauded for remaining honest through its complete lack of closure, but Green provides us with a full denouement and conclusion). It derides cheap sentimentality, then uses it as a crutch to make the reader Feel Something. In the end you just can’t have it both ways, and that’s why The Fault in Our Stars is a failure to me. *”breakfast exlusivity?” WHO TALKS LIKE THAT?! You can tell me that these kids have been forced into early adulthood due to their circumstances until you’re blue in the face and I won’t buy it. I’m well into adulthood right now and have never heard anyone, ever, talk in such a contrived manner.